Hey all, it's Rick here again. 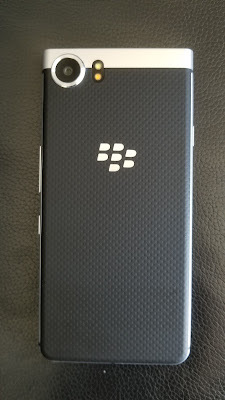 I've had the Blackberry KEYone for just over a week now and thought it was time to tell you about some of the features and items I like about it. It's still pretty early in the game and there's been a few maintenance releases and such, but overall I'm finding the Blackberry experience to be quite nice. Body - I really like the way the Blackbery KEYone (BBK1) feels. It's a nice solid device with a very cool executive look. It's not too thick even with the keyboard and the screen is a wonderful size for email and texting. I was afraid that the keyboard was going to take up too much real-estate when in fact it made it easier to type while still seeing what I was typing. Granted, in landscape mode for watching YouTube and such, the screen is smaller than many of the other devices on the market today. All I can say is watching videos on the BBK1 is a pleasant experience. The picture is crisp, clear and bright. I found it quite comfortable to hold it in landscape mode as I didn't have to place both hands solely around the edges to hold it for fear of blocking the screen. The Keyboard - oh boy. 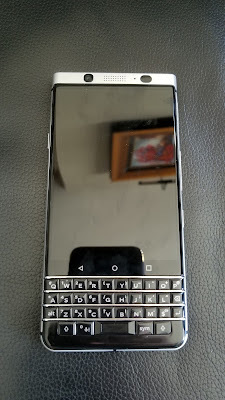 So, as an old Blackberry user I was really torn up when I had to move to an android device that was all touch keyboard. I got used to it though and never looked back. Coming back to a Blackberry after all this time had me at a slight disadvantage. There's a learning curve to using a physical keyboard. It's only been a week, but I'm getting the hang of using it again. The buttons feel nice. They have a slight click when you push them, though they push easily and smoothly. Word prediction is particularly nice on this device and they built in really cool swiping gestures to choose the predicted words. For example 3 predictive word options pop up. One on the left, one in the middle and one on the right just above the keyboard. Just swipe up on the physical keyboard to the left, right or middle to choose the word. Cool! You can also swipe back to delete. 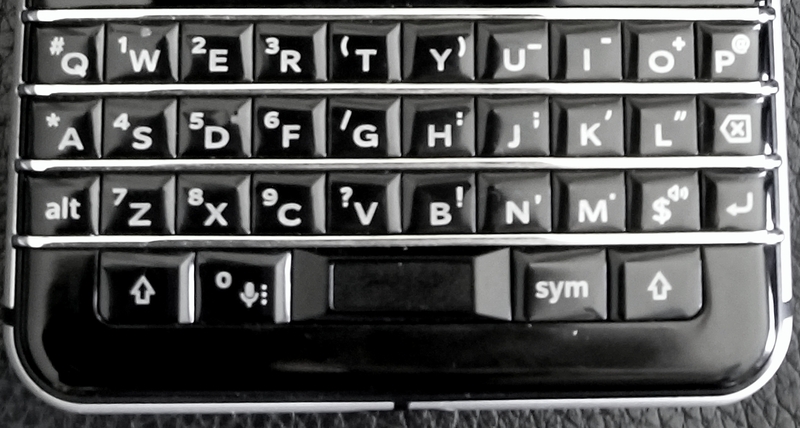 The keyboard also works like a track pad on multiple apps - when reading articles, scrolling through text messages, surfing or in the Blackberry Hub. Just swipe your finger up and down to scroll. Microphone - Look, lets be honest here. Blackberry is highly regarded in the business world. As such, the basics of a phone call are quite important. This phone is great for conference calls! People report being able to hear me loud and clear. I've used the microphone on the device itself with speaker on and off. Not one complaint from the listener on the other end. The noise canceling microphone does a nice job, though as with every device I've ever owned the cancelation is stretched to it's limits when used in NYC with all the sirens and constant background noise. General background noise like typing etc. is still picked up from time to time, though the speakers voice is the prominent sound to pass through. This holds true for the mic when speaker is turned on or off. Also, the headset is great for conference calls. I'm often using 'Skype' with a USB headset which sounds nice and clear. However, when I used the BBK1 to dial in to my conference sessions no one was the wiser. I asked how I sounded and everyone said 'loud and clear'. I haven't tried the headset/earbuds for music yet. They don't look like much, but hey - they could surprise me. From a phone call standpoint they sound great. People come through clear to my ears and not tinny. In a time when some manufacturers don't put any headphones in the box, this is a nice addition to have included. The finger print scanner is one of the best I've had experience using! Hands down.. seems to just work. It's built into the space bar on the keyboard and hasn't failed me once. I haven't had to clean the sensor like on some of my other devices. It's pretty cool placement and though I initially had it set to read only my thumb, I've also added my pointer finger to make it easier to access while the device is lying down on it's back on the desk. TIP! When the device is asleep I've found I could just push the spacebar with my finger and it will read my print and unlock at the same time. This is a fantastic way to get the device unlocked and operational very quickly. 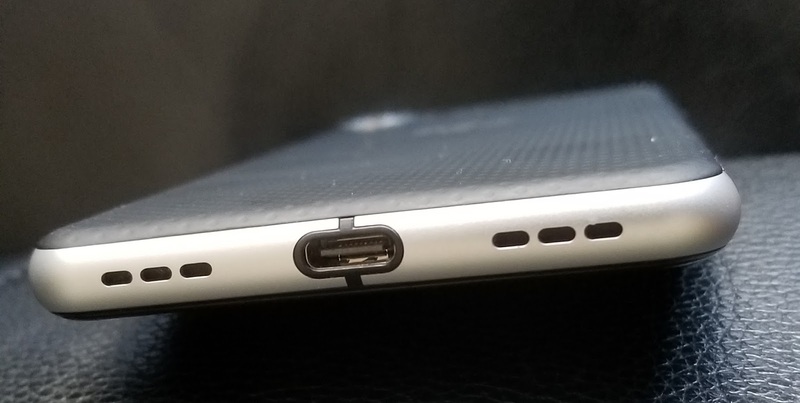 Quick Charge 3.0 with the USB-C works really well on this device bringing it to 50% in around 30+ minutes. I find it depends on what's running in the background so they also included a feature called 'Boost Mode' which stops apps from running in the background to conserve energy and charge faster. This Boost Mode only works up to 50% and then switches to regular charging. You can change this setting to boost charge to 100%, but keep in mind Email, Messaging and other apps may not update unless you open them. The BBK1 comes with a 3.0 Quick Charger in the box. Battery Life - well, I have to say I'm not a HEAVY user by any stretch. 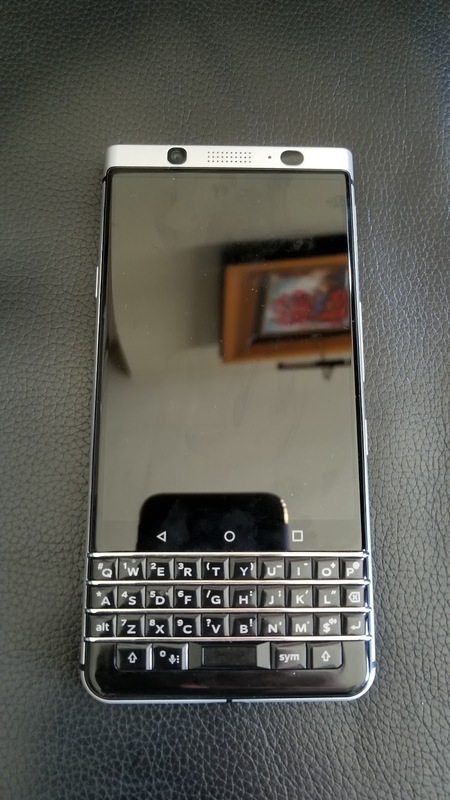 Since most of my days are in front of a computer I don't go to the KEYone that often. That being said, I charged the phone fully the day I activated it and in a week I've only had to charge it again once. I'm at 28% as I write this and will put it on the charger soon. Blackberry Hub App - love it or hate it? Blackberry Hub comes native on the BBK1. Personally, I like that all my messages, calendar items, emails etc are all in one place. I have the option to pull in other messages from my social networks as well, though since I use this primarily as my work device I opted not to include all the clutter. Still, Hub is a great way to see everything at a glance. You can open up any of the items you bring into the Hub and get right to the app it's aligned with. If I click on an email from Hub it brings me to the email in the Email app. Nice touch. Missed calls and text message are right there and available. I like it. There's more.. but I'll get to it as I spend a little more time with this device. Some things do take getting used to - Power Button on the left instead of the right and I've become reliant on an always-on display. Maybe in a software update? I also love the functionality of my Keyone but have recently been dealing with a software issue regarding the MMS / WIFI service. After talking with Sprint support I have learned that if I have enabled the WIFI service I must disable the Data Saver setting (with exceptions Messages, Phone, Hub, Voicemail apps) to receive MMS. While out of WIFI range or with WIFI disabled I may keep Data Saver enabled and still receive MMS. Only the MMS service is affecting by these settings; my phone, Hub and SMS work whether or not WIFI and Data Saver are enabled. Also have noticed that as soon as I turn WIFI on the LTE light goes out on my cell signal icon. 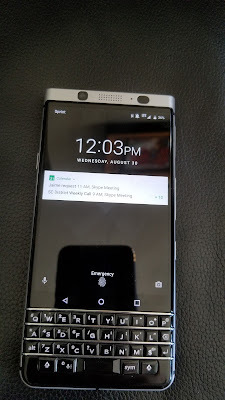 Wondering if this software issue is a bug fixable by Android, Blackberry, Sprint or any of the above and if so how do I get through to someone who can address the problem? Maybe there is another app exception that I need to add to Data Saver? That is interesting feedback Sandy. I'll see what I can find out. I've tried, but haven't been able to recreate the issue. Have you spoken to anyone at Sprint to go through some troubleshooting? Thanks, The fact that you weren't able to recreate the issue is good to know. Yes, I have spoken to multiple Sprint reps and done all the troubleshooting. Does the LTE light go out on your K1's cell signal icon when you enable WIFI? Do you know which apps need to be excepted by DataSaver to receive Phone, SMS, MMS? I have disabled apps I don't use like BBM and installed apps I do like What'sApp. So assume the issue must be unexpected behavior from my config but it would save time to know the answers to those questions before I proceed. Under your data saver you'll want to enable 'Messages' if you're using the default messenger on your BBK1. You'll also want to enable 'What'sApp'. I installed What'sApp to test it out and had to enable it in Data Saver to receive the access code. Here's screenshots of what mine looks like. Ok. For purposes of this test I enabled BBM and excepted it in DataSaver. In addition BBM, I have calendar, hub, hub + services, messages, phone, voicemail and WhatsApp excepted. With Data Saver and WIFI enabled, MMS is blocked. After 5 mins, I disabled DataSaver and the message was sent 1 minute later and all blocked MMS messages were immediately received by me. My "On the road" config (WIFI off, DataSaver on) also works for MMS. Note that the LTE light on my cell signal icon goes on immediately when I turn WIFI off before leaving home but is not on in the previous screenshots when WIFI is on. I just put my phone into Airplane mode. Turned on Data Saver, Connected to WiFi and sent a gif message no problem. Next I put my phone onto the network, turned off Wifi and kept Data Saver turned on. I used the same GIF image and it sent again with no problem. Maybe there's another way you'd like me to test this as well? It could be I'm missing something too... let me know. Does the LTE light on your cell signal go out when WIFI is turned on? I wonder if my Sprint service is immediately degraded from 4g to 3g when WIFI is on. My test was with .png screen shots but I initially noticed the problem when I did not receive .jpg MMS and Group text MMS with my DataSaver, Wifi on config. Interesting.. When I turn on my WiFi I still show LTE with 3-4 bars pretty solid on the 27th floor in Midtown Manhattan, NYC. Do you have any other network restrictions on? If you go to Settings > Wireless & networks > ...More (under the Wireless & networks heading) > Cellular networks > Preferred network type should show Automatic. What happens if you change to LTE/CDMA? Just a test. By chance, did you also try a 'Network settings reset' from that same menu? That could be a good thing to try. Lastly, was curious if you've updated to the latest software version. Blackberry created a separate App for updates rather than burying it in the settings menu. Go to apps and open Update. See if you have the latest version. Even if it says your system is up to date it can't hurt to click the link to 'check for updates now'. Picture below of my network connectivity with WiFi and LTE enabled along with data saver on. Solid LTE network performance with Data Saver and WiFi turned on. I just tried a group message with a large jpg as well. Seemed to go through with WiFi and LTE on and data saver. Tried again with LTE on and WiFi off too. Does the LTE light go out on your phone when you turn on you WIFI service? Just turned back on Wi-Fi and LTE stayed on and strong. Data Saver has been enabled since last night. Did you look into the other things I mentioned? Not sure it they'll help, but worth a shot. Are there any other network restrictions on? Good ideas but none worked. Ran my test over public WIFI in a 3g area near me and the results were the same as above (including the 3G light which goes out when WIFI is enabled). On my Keyone, MMS is blocked if enable both Data Saver and WIFI at the same time. For now, I going to keep toggling my home and on the road config until I can get to a Sprint store. 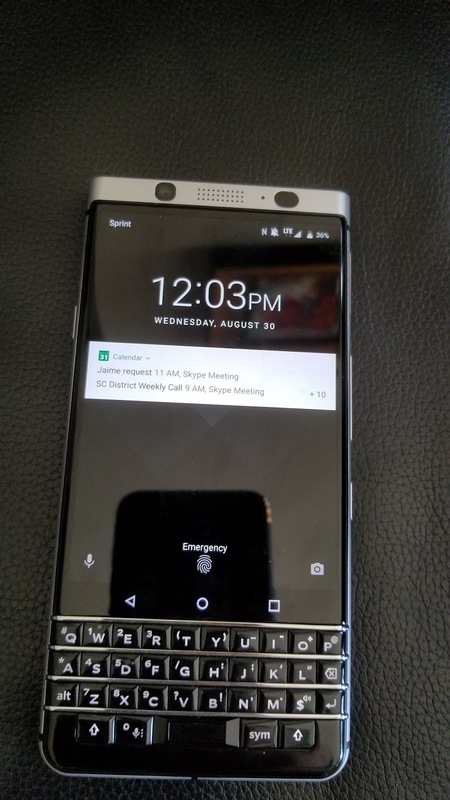 Since you cannot replicate my issue on your Keyone (especially the LTE light when on WIFI question), I now believe the issue may be the hardware itself so will ask them to check it out. Thanks for your help! Sorry I couldn't help more. Definitely bringing to the store is a good next step. Good luck and let us know how it turns out!